Our anti-aging Vitamin C Repair Cream is made in USA with Natural and Organic ingredients. 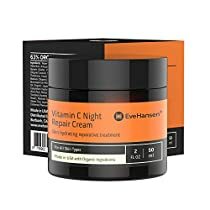 Known for its light but super moisturizing and restorative properties, our night cream is loaded with powerful antioxidants and nourishing nutrients such as Vitamin C, Vitamin B5, Coconut Oil, Shea Butter, and Green Tea extract, which help to firm skin’s appearance, minimize fine lines and wrinkles, and repair damages and dryness associated with daily activities. It stimulates the healing and repair response in the skin, helps fade sunspots, and prevents the formation of new free radicals in the skin from damaging sun-exposure. Our unique reparative formula is rich in texture as it hydrates and restore the skin, imparting a visibly radiant, smooth, and younger looking skin appearance.